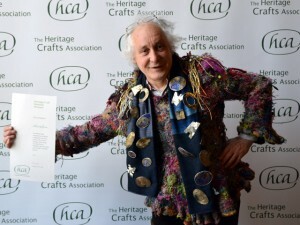 A shoemaker, a lacemaker, and a letter carver were among the people recognised for their contribution to heritage crafts at the Heritage Crafts Association annual conference at the V&A in London on 9 May. Almost 200 people attended the conference, A Place for Craft, which focused on the relationship between location and heritage crafts. 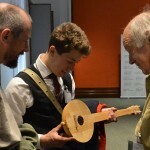 The day included talks from a range of speakers, a display of tools brought and displayed by makers attending the conference, and an opportunity for makers to pitch their products to Genevieve Sioka, artisan buyer for the National Trust. The conference was part of the first London Craft Week, a celebration of makers and craftspeople across London. 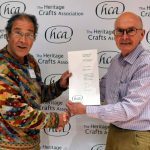 This was the second year a suite of awards was made specifically for heritage crafts. The awards were made by the Heritage Crafts Association in partnership with Queen Elizabeth Scholarship Trust (QEST), Marsh Christian Trust, and National Association of Decorative and Fine Arts Societies (NADFAS). 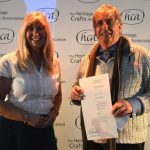 Shoemaker Bethan Horn was awarded an HCA/QEST Training Bursary. This will enable her to build on her training and become an ‘at the bench’ apprentice, learning from a master craftswoman, Ruth Davey, of RED Shoes. Jean Leader was nominated by the Lace Guild for her voluntary work in promoting and supporting lacemakers. She created the first website for lacemakers and worked with museum curators to identify and catalogue lace collections. She was awarded the Marsh Volunteer of the Year. Charles Trevor received the Marsh Made in Britain award for his contribution to handmade leather goods industry in the UK. Established in 2008, Equus Leather makes luxury leather goods, entirely by hand (including hand stitching) using traditional tools and techniques. Mary English was awarded the Marsh Trainer of the Year. Mary has worked in ceramics for more than 25 years and has trained more than 500 children and adults. Mary specialises in pit-fired ceramics and several of her trainees now instruct others in this traditional method. 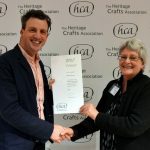 Lettercarver Luke Batchelor received the HCA/NADFAS Heritage Crafts Bursary to enable him to continue learning his trade and travel to Italy to develop his skills in letter carving in Carrara marble and study ancient lettering. 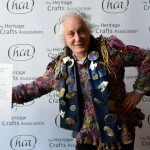 Hat block maker Owen Morse Brown was awarded the HCA Maker of the Year. With a background in making musical instruments, Owen began making hat blocks in 2007 and has more than doubled sales from £77k in 2008 to £195k in 2014. In 2013 Owen launched a new collection of hat blocks and has promoted blocking and millinery through demonstrations, talks, shows and fairs. He is passionate about passing on hat blocking skills. Letter cutter Lida Kindersley MBE and arrowsmith and historical metal worker Hector Cole MBE were presented with certificates to mark their inclusion in the New Year’s Honours List earlier this year.